In addition to Facebook’s redesigned events page, the social network also created an easier way for users to create duplicate events. 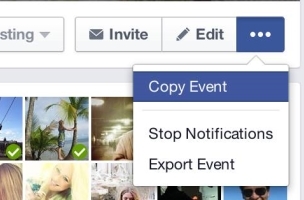 Facebook introduced a “create repeat event” feature in December 2012, which allowed users to copy details and invited friends from past events into new ones. Reader Matteo Gamba shared the screenshot above, saying that the “copy event” feature duplicates events and their guest lists. Readers: Have you seen the copy event feature?